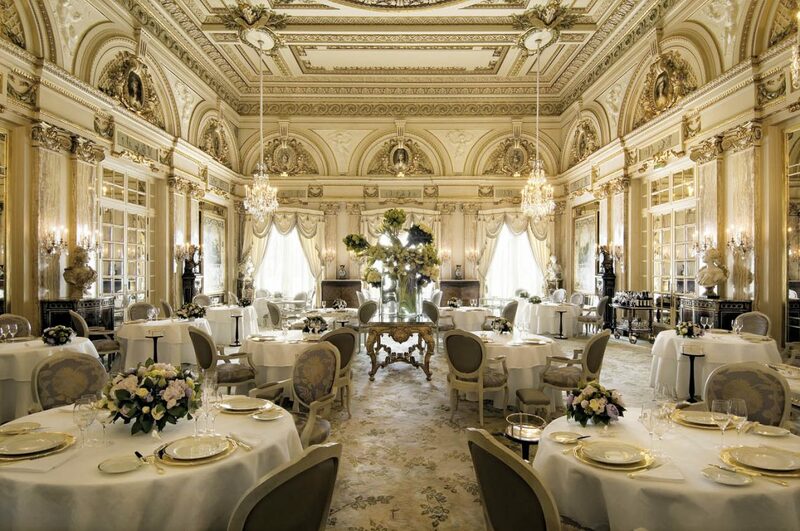 I always consider myself very lucky when it comes to restaurants I have been fortunate enough to visit, but none so much as Le Louis XV by Alain Ducasse at the Hotel de Paris Monte-Carlo. 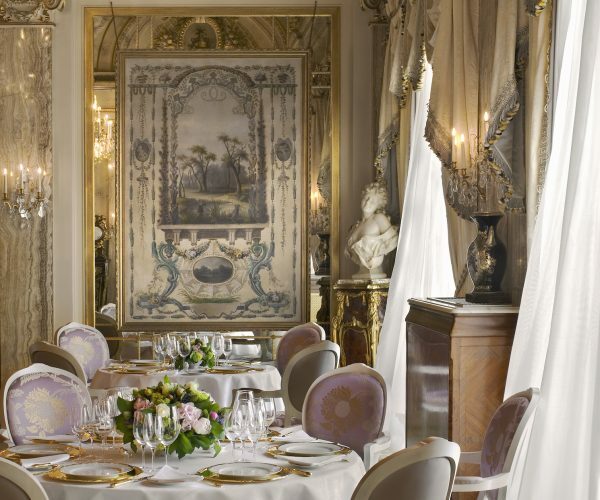 Since its opening within the Hotel de Paris more than 25 years ago, authenticity and culinary elegance have always been delicately combined at Le Louis XV. In an elegant room of gold adorned with crystal, reminiscent of Versailles Grand Siècle, all the hands on the clocks are stopped on twelve as a reminder that inside this “Palace of Pleasure” time is of no consequence. The menu, a Mediterranean and seasonal symphony of a style that Alain Ducasse qualifies in one word, “essential”, offers a wide palette of exquisite dishes that capture the senses. From the moment we entered the elegant dining room to being the last to leave after our culinary journey, every sense was engaged, tantalised and overwhelmed, an experience one is never to forget. Ascending the elegant stairs of the Hotel de Paris, like a silver screen movie star under the twinkling glow of the Monte-Carlo casino square, we entered the opulent lobby; to the right of this space is the entrance to Le Louis XV, hidden behind grand mirror panelled doors. Time seems melts into insignificance the moment these magical doors open and one enters the dining room. Like floating on air you glide to your table, the romantic lighting providing that perfect soft focus glow as you take your seat and begin the sensory journey. We were greeted by the maître D of the restaurant, Michel Lang, who has been in this position since 1992 and who started off our evening with a glass of Champagne Lanson Noble Cuvee Rose; bright light-pink colour evocative of romance with a myriad of fine bubbles with aromas of dried roses and berry-like fruits. While sipping this cool refreshing aperif, I took in the full grandeur of the room. From our perfectly positioned table, we could see the comings and goings of the immaculate waiting staff, like a well choreographed dance as they spin and twirl, all moving in sync with perfectly presented plates of delight softly delivered with ease to each table, like watching a culinary music box. So engrossed in the spectacle in front of us, we almost forgot to even glance at the menu. Fortunately for us though, the chef, Dominique Lory, had decided to serve us a special menu created just for us. I thought I could not be more excited but it seemed the best was still to come. Our first course took raw freshness of ingredients back to its most basic and simplest form, the Primeurs de nos paysans à cru, sauce olive et fines pâtes imprimées. This dish consisted of a glass full of trimmed salad vegetables from radishes to carrots as well as leafy varieties including crunchy lettuce and chard served with a black olive dipping sauce. Simple, elegant and fresh, like taking a walk through your mother’s vegetable garden as a young child and eating the fresh produce straight from the earth. Such a simple dish, but innovative in that it made the main focus the vegetables rather than their usual presentation as an accompaniment to meat or fish. For the next course, my dining partner and I had different dishes, mine being the Bouillon de chataignes au fumet de gibier a plumes garniture mijotée et caillé de brebis and his being the Gamberoni de San Remo avec delicate gelée et caviar. Served in a bowl, mine consisted of a warm chestnut broth with plump pink pheasant breast and sheep’s curd, a very warming autumnal dish that evoked memories of the hunt and hearty home-cooked game broth. The pheasant was perfectly cooked and melted in the mouth, the sheep’s curd added a soft fresh creaminess to the dish. My partner’s dish consisted of a serving of cold San Remo prawns placed delicately on a seafood jelly topped with a generous helping of caviar; a seafood explosion that provided contrasting textures and sensations with each bite. Alongside this dish, the Sommelier served a stunning white wine, the Château de Bellet Cuvée Baron G 2011; golden in colour but fresh, smooth and clean to the taste, the perfect accompaniment. Up next was Alain Ducasse’s signature Cookpot, having tried the summer version at his restaurant at Plaza Athennee in Paris I was anxious and excited to try the autumn version of this classic dish. This Cookpot came with a twist, not just vegetables but fruit which added a depth to the dish that one was not expecting, the sweetness of the dish made for a comforting experience that echoed back again to home-cooked meals on a cold autumnal day. Following this was the fish course, Loup de Mediterranee en filet pigue d’olives, fenouil fondant et oignons fanes. The seabass fillet was plump, juicy, moist; everything one would hope to expect from such a fish, but the interesting part of this dish was the contrast of the fennel which was bitter, sharp and sour. Normally, I would not think to put such a strong tasting ingredient such as fennel with such a delicate fish as seabass but it worked, with each forkful my mouth tingled as the fennel leapt forward, announcing itself as the major taste influence of this course. I was stunned but impressed. Now one thing I have always liked about French dining is the importance of the meat course. So important is this course that French cuisine is designed around this one dish. With this in mind and what with us being in a 3 Michelin Star French restaurant, I was somewhat excited at the thought of what was to be served for this course. What arrived was a meat masterpiece: Poitrine de pigeonneau des Alpes-de-Haute-Provence, foie gras de canard sur la braise, polenta du Piémont, jus goûteux aux abats. The pigeon breast was succulent, perfectly seasoned and well matched with the acidic reduction sauce, the goose liver was like butter and the knife just slipped through the rich meaty velvety portion of foie gras. Thinking back over the meals I have eaten, I am not quite sure I have ever tasted something so appeasing to a carnivore as this dish. Again, it was such a simple dish but the raw essence of just meat was perfect, no fuss, no distraction. Served with this striking dish, was the Clos Saint-Joseph 2011, a very interesting red wine in that is deep in colour and aroma but light to taste, allowing the ingredients of the food to do the talking with the wine providing a supporting act. 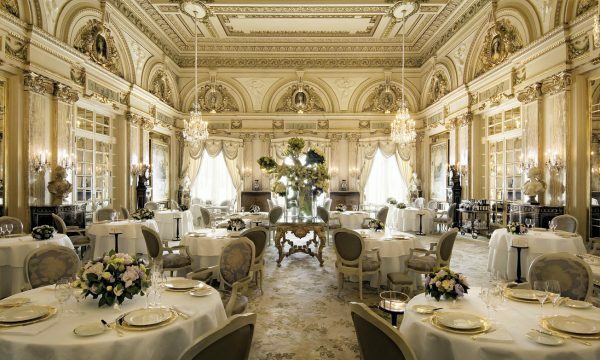 The pleasure of Le Louis XV was far from over, and in keeping with the idea that time has no control over this restaurant, we continued on with little care to the time of day – for Alain Ducasse had us hypnotised. Dessert was a tricky decision, everything looked too good, so I decided to opt for the house classic Le Louis XV au croustillant de pralin which has been on the menu since the restaurant opened, while my dining partner ordered the Crème glacee au lait entire et fleur de sel, croquant caramel au caillé de brebis. The milk ice cream with chocolate and salted caramel was divine, sweet but light, the crisp wafers added that much needed texture. The Louis XV however was on another level, visually striking, a chocolate block brushed with gold on a azure blue plate, as the fork cut through the sticky chocolate it hit the crunchy center of water and praline, rich and sweet, this dessert was devilishly naughty. With each bite the chocolate melted leaving tantalizing brushes of cocoa and gold on the lips – like lust the dessert quickened the heart and caused breathlessness. If the starter was the representation of all that is pure, this dessert was unadulterated sin. Both desserts were served with Forteto Pian Dei Sogni 2008, a dessert wine from Piemonte Italy, a well matched offering by the Sommelier as the sweetness and texture of the wine stood up to the robust nature of both desserts. Thoroughly undone physically and mentally, it was time to leave the limbo of time that is Le Louix XV. We were the last in the dining room, having allowed the experience of such a restaurant to carry us away on a journey of mind, body and spirit. All five senses had been engaged, surprised, overwhelmed and soothed but it was now time to disappear in to the warm dark night and back to where clocks unfortunately had meaning. Saying goodbye to the wonderful staff and beautiful dining room it felt like we had found the exit to the sensory labyrinth of Alain Ducasse but wished we had not, for the moment our feet stepped over the threshold it was back to reality and the cold hard ticking hand of time. Want to experience something out of this world? 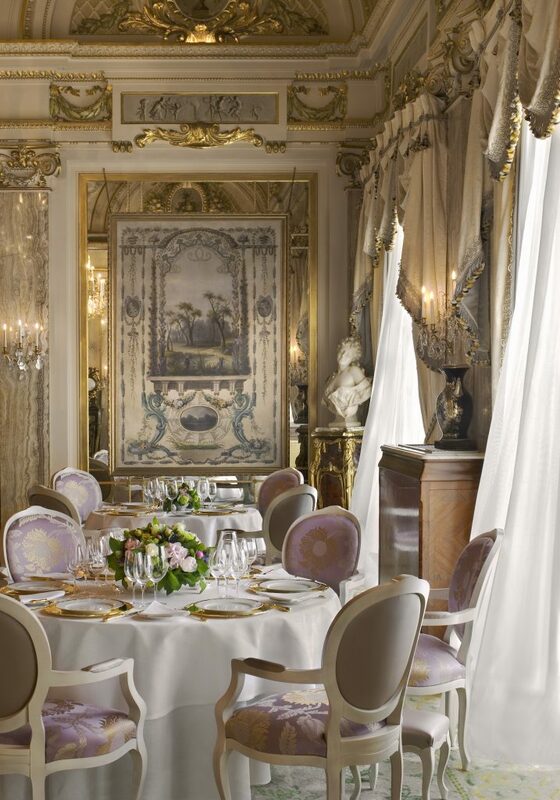 Look no further than behind the looking glass of Le Louis XV.